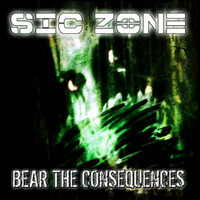 Some bands really are trying to expand boundaries into Metal for the last years, running away from old models and paradigms, mixing a lot of influences, and sometimes, they hit the bull’s eye, and SIC ZONE, a quartet from Germany, is an insane definition for chaos, with their album “Bear The Consequences”. They do a chaotic and heavy mix between Death, Groove, Thrash and Djent Metal, sounding as you putted PANTERA, MESHUGGAH, FEAR FACTORY, MACHINE HEAD with some strong touches of Industrial Metal and Progressive. But don’t be naïve, dear reader: they’re pretty good, a fine new name in Metal. Be prepared for a blitzkrieg of harsh vocals and grunts along with high pitch voices and more calm (but not clean) ones, guitar riffs insane and brutal mixing with clean chords, bass and drums using and abusing of technique, but never losing the heavy grip in our ears. It’s very chaotic, but never without sense. But try not to love songs and the speakers’ melting “Uncompromising” (aggressive and intense, with some good vocal variations, and clean moments amongst the musical chaos), the powerful “Lord Of Chaos (And the Wings of Steel)” (the name speaks for itself, in an inferno of guitars riffs and broken tempos from the drums), the two parted insanity of “Falling Lost Part 1” (a more calm song, with clean guitars and whispered voices) and “Falling Lost Part 2” (this one is a chaos of distortion, and pay attention to the rhythmic basis, bass and drums giving a show by themselves), or “Sweat Person”. But have in mind that all tracks are fine pieces of Metal. A good name that is only starting, so let’s wait and see this chaos grows and engulf us all.